Public-domain illustration via saamiblog on Flickr. Font: Dominican, via dafont.com. Text adapted from multiple sources, including First People. I can’t think of a better meditation for the first day of the year. Thank you. Have tried to use this as my personal philosophy for many years. Thanks for posting it, H! You’re very welcome, Chris! 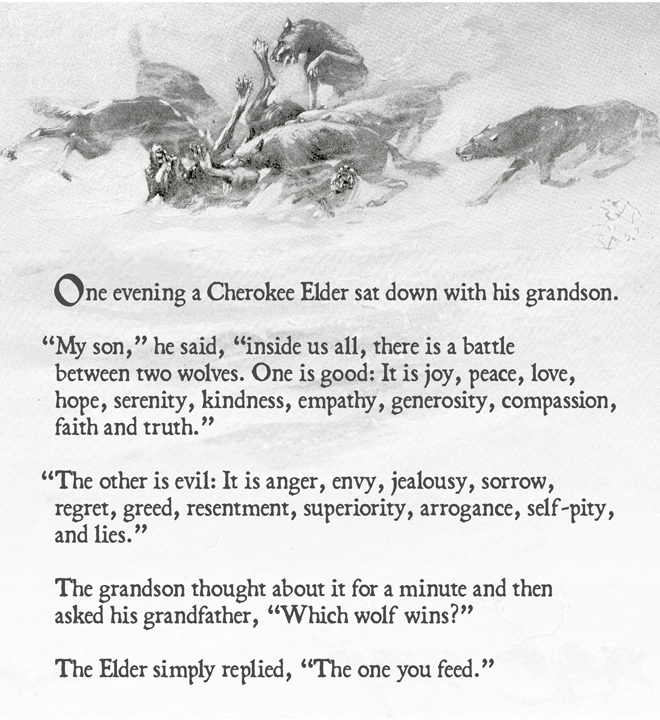 I’ve heard many versions of this story over the years and have always been drawn to its deceptive simplicity — deceptive, because sometimes it takes courage and wisdom to “feed” the right wolf. Hope 2013 is off to a wonderful start for you, and best wishes for a wonderful year ahead. Cheers! Such wisdom! Thanks for sharing. Happy New Year! And a very happy new year to you, too, Patti! Cheers from Minnesota!! Great idea to start the year, and carry right through. I wish you a wonderful 2013 as well, Xpat, full of good health and fun adventures and photographic inspiration. Cheers from waaaay across the pond! Thanks for this precious reminder! Words to live by and share. All the best to you in the new year. And thank *you* for stopping by! I hope 2013 brings you great health, happiness, and a renewed commitment to living as fit and full a life as possible. 🙂 Cheers! How fantastic to have stumbled upon your blog this evening! I love this meditation so much – thank you for sharing it. It’s my first visit to your blog and I havent’ read any more of your posts (yet) but felt compelled to comment. I’ll be back I’m sure. Thank you so much for stopping by … and especially for your kind comment!